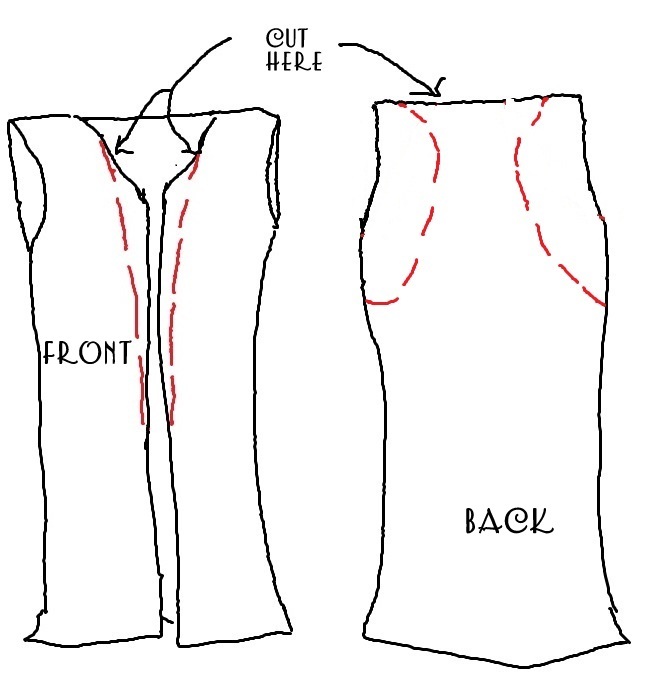 WobiSobi: No Sew, T-Shirt Vest. 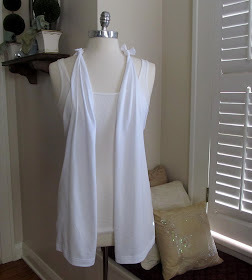 Super Easy, No sew, T-Shirt Vest. I don't know about you, but I have been seeing these vests everywhere. My sister always has such cool ones. Cute, easy, and comfortable, vests like these are a really adorable way to layer and change up an outfit. Wow!, and it only cost me $3.00. 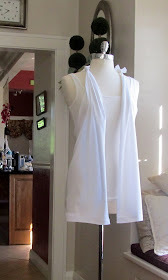 ( I bought a pack of 3 ,v neck, t- shirts for $9.00 ) Now I can make one in every color and it won't break the bank. I made a basic White one this time, but I think a black one is next on my list. Go design crazy, use your imagination, add things like pretty ribbon, or ruffles, buttons, chains, flowers, really experiment, that's the fun part. 1. 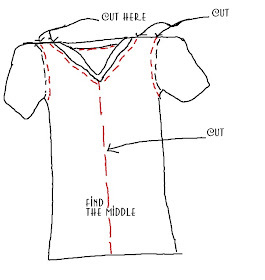 Fold the t shirt in half, to find the middle~ I ironed it to mark the middle~ or you could mark the middle with chalk. 2. Cut on the red lines. 3. 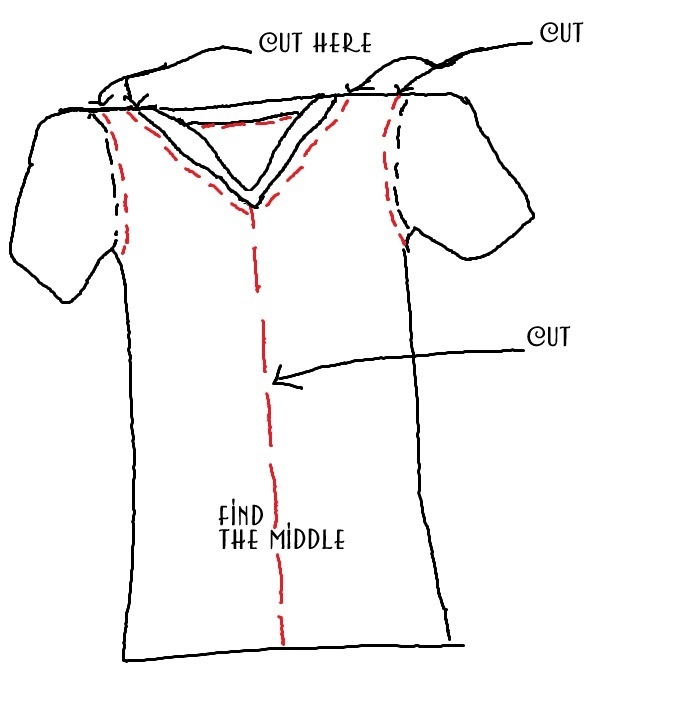 After you cut the main cuts, you are going to have to trim it down a little more, like the shirt in the picture above. 4. Trim 6, one inch strips, of t shirt material~ I used the sleeve~ and tie the shirt as shown in the picture above. Two up around the collar bone , and Four in the back. 5. 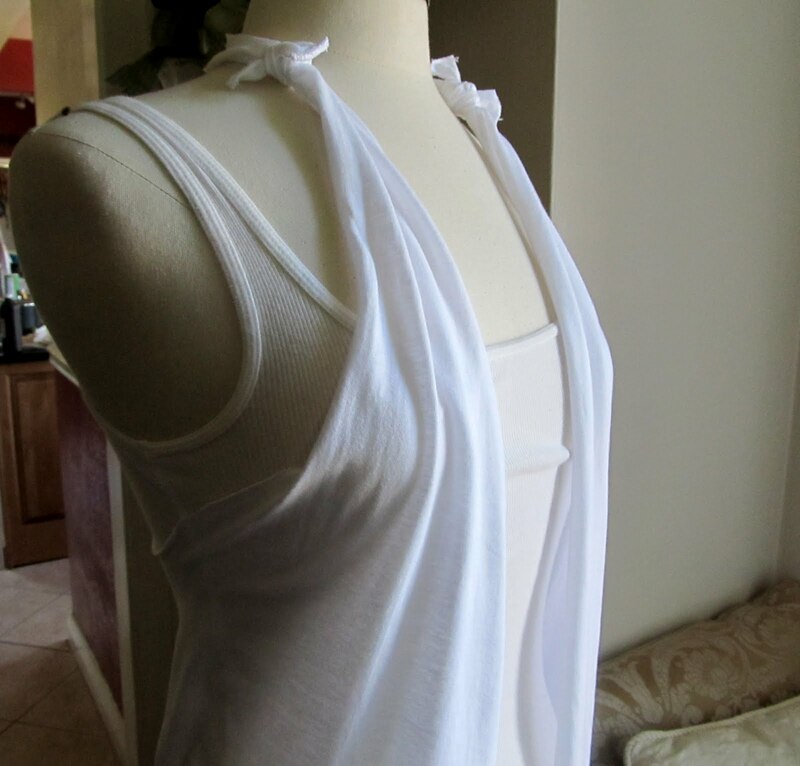 I stretched the material under the arm and around the neck to make the material curl. you are done with the basic vest. Now you can change this up any way you want. I am still thinking about how I want to make mine different. Some other easy Vests I made are on the links below. and another no sew T-Shirt Vest HERE. I also have a Re-Style tab at the top of this page. You can click on that for all my other Re-Styles. YOU ARE BRILLIANT. That is all :). I'm a really big fan of this kind of tee :). That is so cute and looks so simple to do. I may just have to give it a try. Thanks for sharing. SOOO cute!! I'm gonna have to (try to)make some =D Stopping by from Sunday Scoop Link Party. 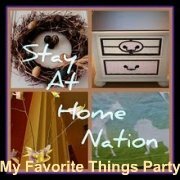 I would love for you to link your post to My Favorite Things Party going on all week. Hope to see you there! I just found your blog and I must say, this is brilliant! Those vests look great with long sleeve shirts as well as short, so with winter coming up, it will be a great way to spruce up the wardrobe on the frugal side. This is super cute! Done & done! Found this thru pinterest. These would be great to pair up with some alabama chanin style work. alabamachanin.com Her stuff looks really complex but is very easy... Thanks! I made this and I LOVE it!! I cant wait until summertime when I can wear them with my bathing suit!! Thank you for posting! I love wearing tshirts...this is so freakin cute. I will for sure be making one of these. Thanx for the post!!! No, it does not fray. That is why t- Shirts are the best for no sew projects. Great question! I love this idea it is easy enough anyone can do it. Makes a great group craft with little effort . This would make a real cute swimsuit cover up - absolutely brilliant....!! Thank you so much Linn, have a wonderful night!! I LOVE ALLLLLLLLLLL your DIY- I have two kids and I realize now I'll never be a size 3 again... but that dosen't mean I can't still look great! I'm excited to try your vests I'm always looking for tummy camoflage, these are great for me!! Thx for sharing and adding to my hot mamma style! Thank you so much. for you sweet comment.. 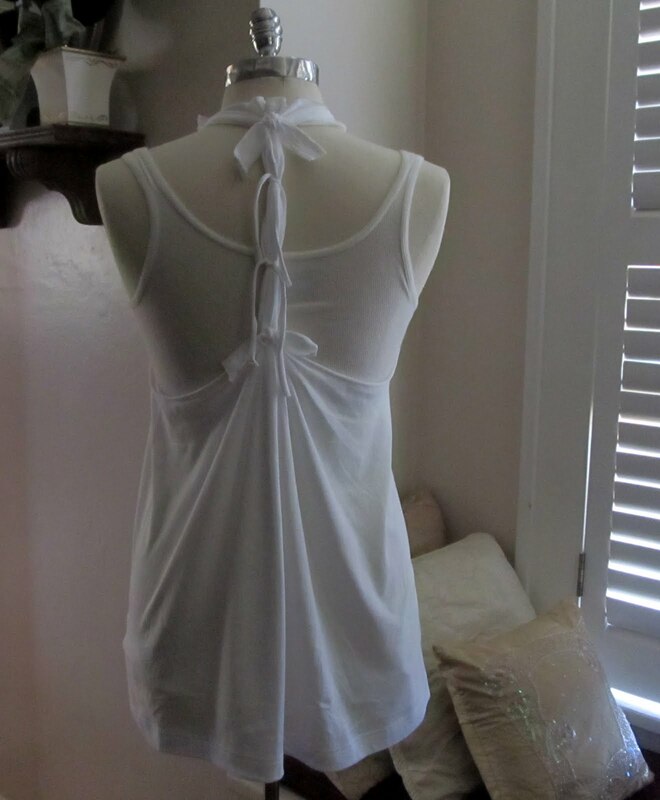 I love this idea and think it would look super cute with ties a different color than the shirt. Thanks for these ideas! I'm totally going to try this. Very cute! Great idea! I really want to try this! Such a cute idea!!! I can't wait to make one! Do you buy the tshirt in your actual size or a size bigger?? I have got to try this. I have a 7 year old grandaughter who would love one of these. Thanks for the great idea. How come you can't print the instructions off. I am not sure why you can't? try saving them, then printing. I love this idea. Great! so cute.. cant wait to try it.. So cute. I can't wait to find a t shirt to use! Hello there you:) so glad you found me. 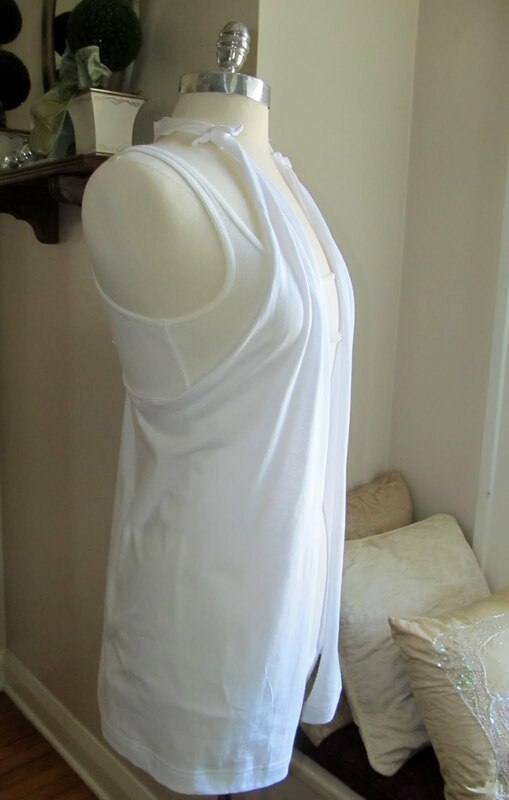 I wear a medium in womens sizes, so I did this vest in a mens medium, the only real difference is the length when you change sizes. 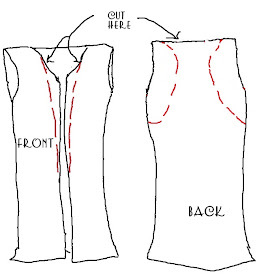 if you would like a longer vest go up to a large. But if your a size 3, then medium or small mens would most likely good for you. I hope this helps. I always practice on an old shirt old my husbands. have a fantastic day. Thanks for posting. Your creativity is inspiring. My 10 year old daughter and I are cleaning out the closets (my T-shirts for her vests, my husbands t-shirts for vest for me). I am an avid sewer, but LOVE the fact that these are 'no-sew' for a fun project that can be done so quickly with so little tools. Please keep sharing your ideas... they really are inspiring. Thank you so much Samantha!! :) have a great day! What a fun DIy project! I love using me'ns tees for projects. This looks so easy! Thank you much! We're bound for Boracay next weekend, and I've been looking for a cute swimsuit cover-up...and this will be just perfect. I'm off to hunt for tshirts...! Thank you! your so welcome! Have a great time! Thank you so much Ana!!! ME ENCANTO QUE BUENA IMAGINACION YNCREATIVIDAD TIENES,,,,deverias de estudiar diseno sigue asi CHICA!!!!!! 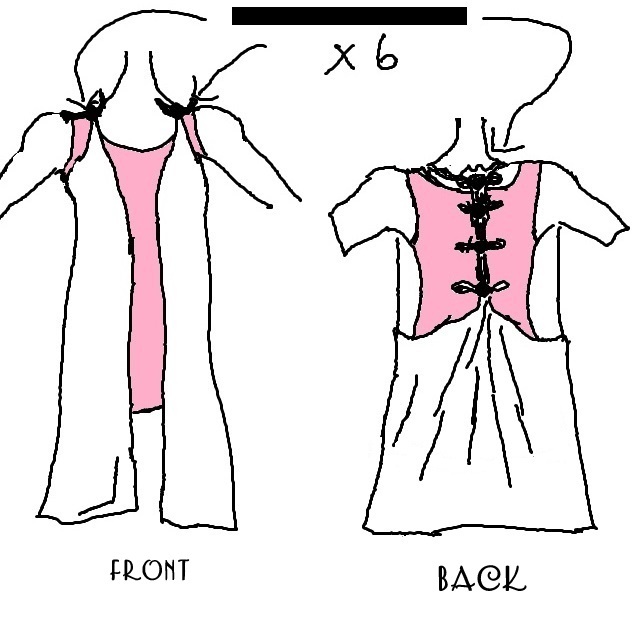 I used this pattern to make a bathing suit cover-up for my daughter. I did not cut down the middle of the front. 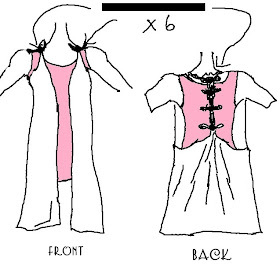 Instead of a vest it is a dress. The way it gathers in the back allows for a little flair at the bottom. Super easy and super cute. super good idea i am going to do that to!!! Hmmmm...I'm seeing one of these in tie-dye for me :) Thanks so much!! Made it tonight! This cost me a whole $3.48! 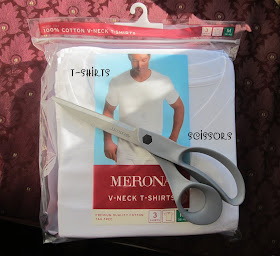 New shirt from Wal-Mart, regular scissors, and now its in the wash getting ready for me to wear to work tomorrow. I have to say I'm really excited!!! I did have trouble figuring out how exactly how to put it on at first, but I LOVE IT! Sorry for my terrible English, greetings from Venezuela. I have some tshirts that are just a little too tight at times, that are just begging to turn into these. Such a great look, soo easy, and super cute! Thanks for sharing! : )..
you are amazingly brilliant. this is perfect for people with the little love handles on the sides of their bodies b/c it covers them perfectly. you are a genious!!!! Found this on Pintrest and happened to have a t-shirt just waiting for a project. Made it in about 5 minutes flat and it's super cute! Thanks so much! Links are giving 404 errors. Hi, nice blog n nice ideas. cud you change the leafy background please? It is really hurting the eyes while reading the lists on the left. The letters and leaves are getting mixed. please dont get me wrong for this suggestion. really sorry to be blunt about it. From simple tshirts to a fabulous one. Very creative and fashionable at the same time. This is adorable! What a great idea :) Can't wait to follow your blog! WOW! what an idea. I will surely do this with my white t-shirt. So handful and easy to do! 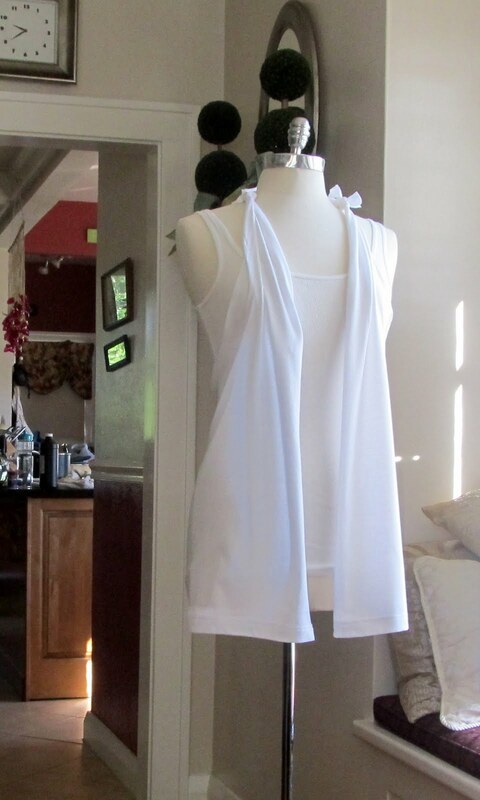 smart and beautiful T-shirt vest. Really Tee like CrimsonTee makes a man more beautiful.